I was in Madison, Wisconsin, for a conference last week. I took advantage of the beautiful autumn weather to pay a quick afternoon visit to the Washburn Observatory on the University of Wisconsin campus. The observatory stands on top of Observatory Hill, at a point from which visitors have a fantastic view of Lake Mendota. Unfortunately, I only had my iPhone camera with me, so I couldn’t do the building justice in terms architectural documentation (and didn’t even try to make an appointment to view the instruments inside, where I was sure my camera would disappoint me), but did manage to capture a few interesting exterior details. 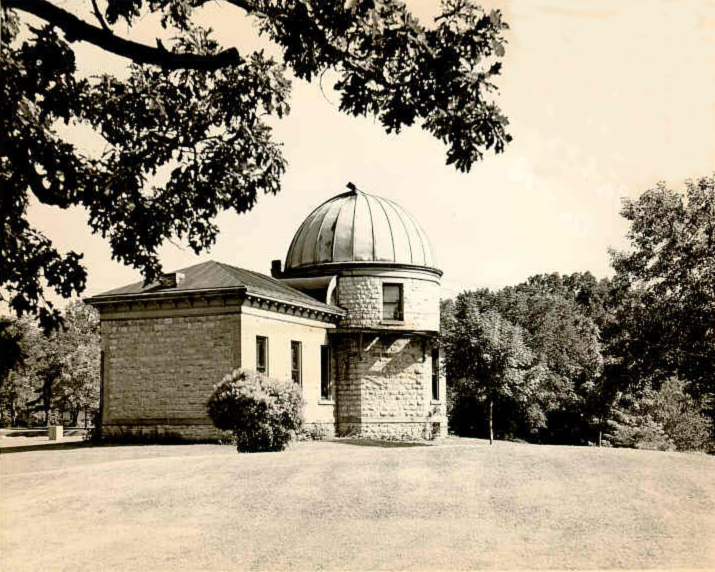 The observatory exists because of the generosity of former Wisconsin governor Cadwallader C. Washburn, who donated the money and selected the site for the building. 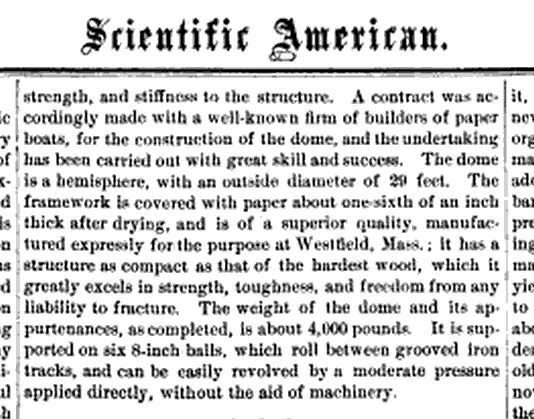 Washburn was apparently motivated by a desire to show up those hotshots at Harvard College Observatory—he agreed to fund the project, but required that the instrument to be acquired for the observatory be larger than the 15″ refractor then in use at Harvard. 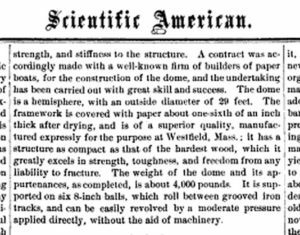 Work on the observatory began in May 1878 under the supervision of architect David R. Jones (also selected by Washburn), and Alvan Clark and Sons built a 15.6″ refractor for the new observatory, temporarily putting Harvard in its place. What stands now on Observatory Hill bears a close resemblance to the original observatory. 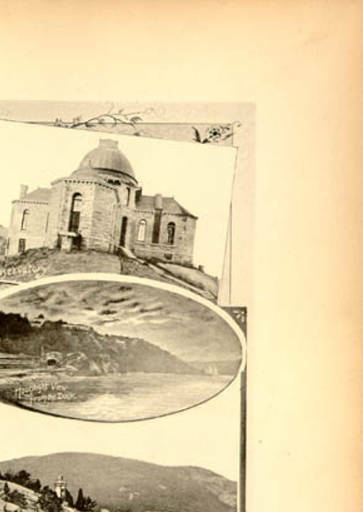 Even before the formal dedication in 1882, the building had been expanded beyond the original program, which had called only for a domed space for the telescope, with two flanking wings to house a meridian circle and other equipment. 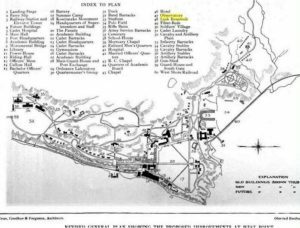 The first director of the observatory, James Craig Watson, requested that calculating rooms and living quarters be added; the addition, built to the east and connected to the first building by a short passageway, was completed in 1881. Watson also provided funds for a second observatory, intending to train students with the telescope in that space rather than with the refractor under the main dome. In one of those tragic twists of fate, both Washburn and Watson died before the observatory’s dedication (Washburn in 1882 , Watson in 1880). Edward S. Holden (b. 1846-d. 1914) transferred from the U.S. 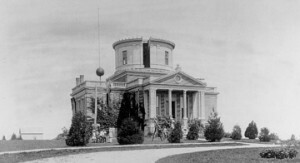 Naval Observatory to Wisconsin, where he served as director of the observatory from 1881-1885. 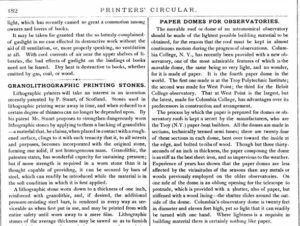 By the end of Holden’s tenure, the observatory’s architecture was largely set in place; only a few small changes took place over the next 50 years or so. For instance, the porch on the east wing was enclosed in the 1920s. 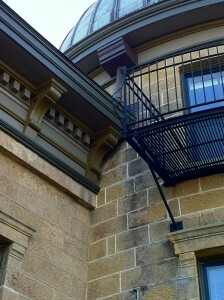 A wrought-iron balcony was added to the main dome (only accessible from the telescope room) at some later date, and the interior of the building was reconfigured at various times to accommodate changing needs for office and classroom space. 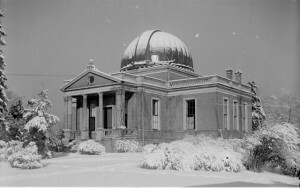 ”] Like most observatories of its age, its instrumentation is useful for lessons in the history of astronomy and public outreach. The real astronomical research at University of Wisconsin has moved on to other spaces and other pursuits. The building was completely renovated in 2008-09 so that it could be given over to the UW College of Letters and Sciences Honors Program. Public viewing sessions with the 15.6″ refractor are still held every other Wednesday (or so); otherwise, anyone is free to walk around and enjoy the observatory’s exterior at any time of the day. This post relies upon information included in the the Feasibility Study for Washburn Observatory conducted by Isthmus Architecture, Inc. in April 2004. Holden left Wisconsin in 1885 to become the president of the University of California. 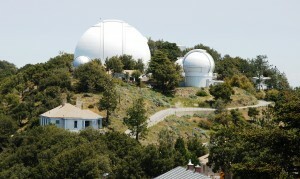 In 1888, he became the first director of Lick Observatory. Cincinnati Observatory (Herget) Building. Photo courtesy of Cincinnati Observatory Center. Going on that tour is a good idea since Cincinnati is the oldest professional observatory in the U.S. and houses the oldest telescope still in use nightly by the public. 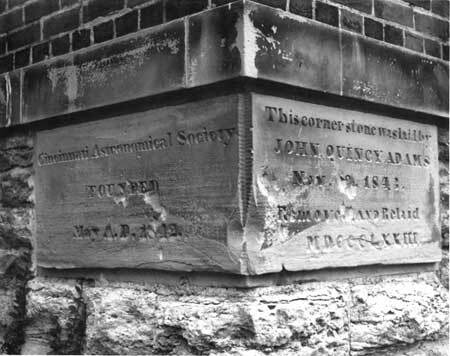 Original Cornerstone of Cincinnati Observatory. Photo courtesy of Cincinnati Observatory Center. Cool, huh? Laid by John Quincy Adams in May, 1843 CE. 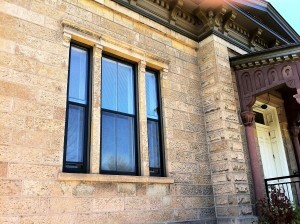 The only problem is, this is the stone from the original observatory building that was constructed on Mt. Ida (renamed Mt. Adams). 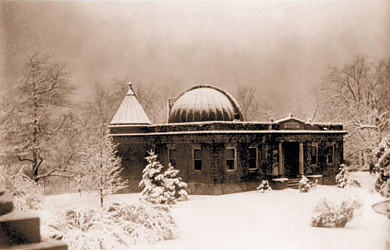 The observatory existed at that location until a few years after the end of the Civil War, when the University of Cincinnati took responsibility for the observatory and its existing instruments. Over a period of two years, beginning in 1871 CE, the observatory was moved to its present location on Mt. 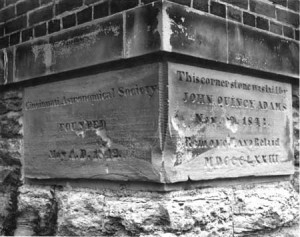 Lookout, where the old cornerstone was incorporated into a new structure. Main (Herget) Building, Cincinnati Observatory. Photo courtesy of Cincinnati Observatory Center. 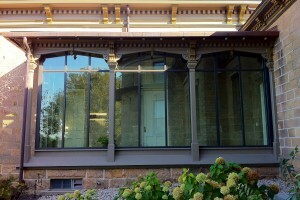 The new building was designed by Samuel Hannaford and Sons, a local but prominent architecture firm. 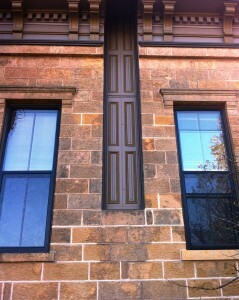 If nothing else, the observatory’s Greek Revival design demonstrates the firm’s incredible versatility. Around the same time, Hannaford designed the Renaissance Revival (aka Italianate) Cuvier Press Club Building (1862), his own late Victorian house (1863), the Neo-Romanesque St. George Parish Church (1872), the Neo-Gothic Music Hall (1878), the Neo-Romanesque Nast Trinity Church (1881), the Second Empire Palace Hotel (1882), the god-knows-what-but-looks-vaguely-Pugin-esque Elsinore Arch (1883), and the Queen Anne style Balch House (1896). 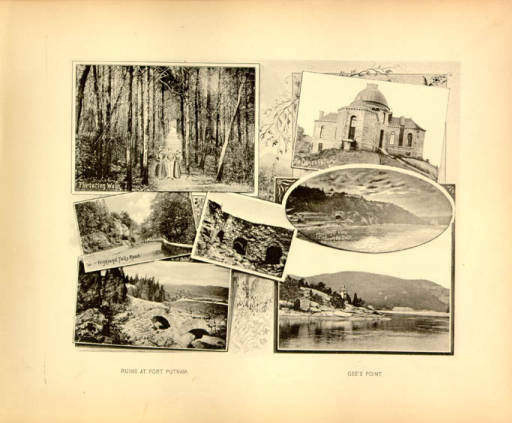 Sure some of his aesthetic adaptability came from his early training at the firm of Edwin Anderson and William Tinsley (compare Hannaford’s work with Anderson and Tinsley’s Romanesque Revival buildings) and some came from a temporary partnership with Edwin Proctor. Most of his creativity seems to stem from his work with his own sons, though. 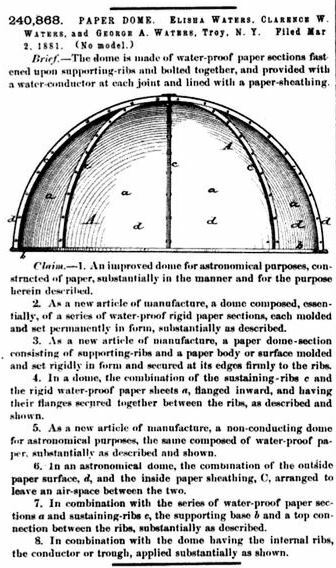 Note the original solution for the rotating “dome.” The flat-sided/flat-roofed cupola rotated on bearings fashioned from cannon balls left over after the Civil War. 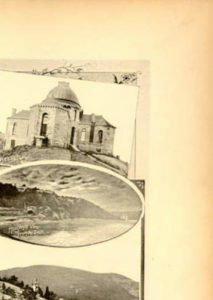 The cupola was replaced with a dome in 1895 CE. Today it rotates electronically, although the viewing door is still operated by rope and pulley. Cincinnati Observatory Mitchel Building. Photo courtesy of Cincinnati Observatory Center. There’s a second building on the observatory campus, the O. M. Mitchel building. 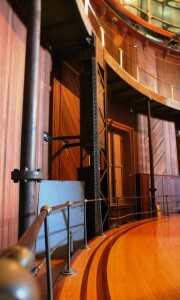 When the 16″ Clark telescope was installed in the main building, the 11″ Merz und Mahler was moved into the Mitchel building. The conical roof on the Mitchel building opened to allow for comet hunting. Nifty, especially in the snow. Albert Einstein and the observatory staff in front of the 40-inch Refractor, 1921. Photo courtesy Yerkes Observatory. I like to check into Yerkes Observatory in Williams Bay, Wisconsin, every once in awhile, just to make sure it’s still standing. 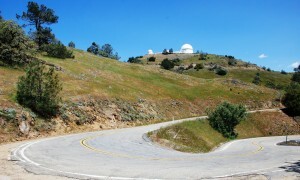 The observatory, which houses multiple instruments (a 102 cm [40 inch] refracting telescope, a 102 cm reflecting telescope, and a 61 cm [24 inch] reflecting telescope, and several small telescopes), is one of several founded by the incredibly energetic astronomer, George Ellery Hale (dates). Although conditions at this observatory are not ideal for observing—they perhaps never were, as Hale eventually left Wisconsin for California in search of skies with less atmospheric turbulence—the observatory still functions as a research space for the University of Chicago. The 40-inch refractor at Yerkes is still the largest of its kind in the world (the 49-inch refractor exhibited at the Great Paris Exhibition of 1900 was dismantled afterward). The mirror for the scope was ground by Alvan Clark & Sons from a 42-inch blank that Hale heard about “by chance.” Some chance! 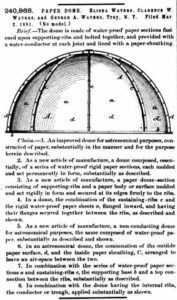 The scope’s tube, mounting, dome, and rising floor were designed by the firm of Warner & Swasey, out of Cleveland, Ohio. 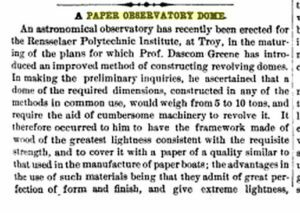 Hale had been working in his private observatory (Kenwood Observatory), but after some back-and-forth with the president of University of Chicago, secured an associate professorship and the promise of new observatory in which he could install the great refractor. 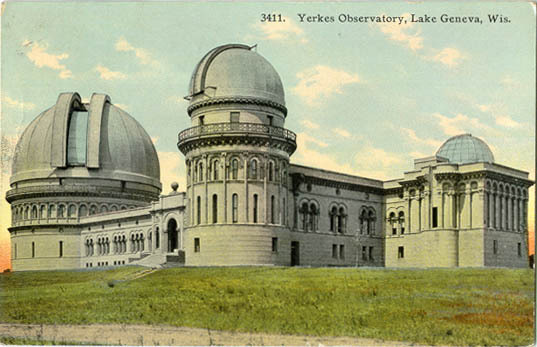 The money to build the observatory came from the pockets of Chicagoan Charles Yerkes, who allegedly was enamored with the project simply because he wanted to build “the biggest” of some interesting thing. 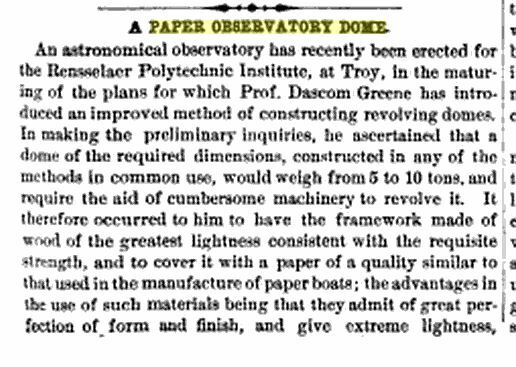 The scope was in place by 1897, and astronomers instantly put the refractor to good use. 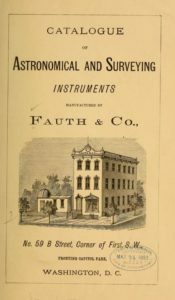 For instance, Burnham’s Catalogue of Double Stars was finished at Yerkes, as was Barnard’s Photographic Atlas of Selected Regions of the Milky Way. A great many of astrophotographic techniques were pioneered at Yerkes, as well. One of the strengths of the Yerkes Observatory is the condition of its telescopes, despite their age. 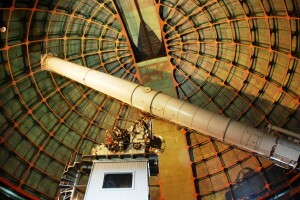 Because of the good state of preservation of the observatory and its continuing relationship with academic institutions, visitors not only have an opportunity to learn about the history of observational astronomy, they can see how observatory and its instruments contributed to the professionalization of astronomy. Yerkes runs programs for students of all ages (including the visually impaired! ), putting young people in contact with both historical and contemporary approaches to research and development at the observatory. 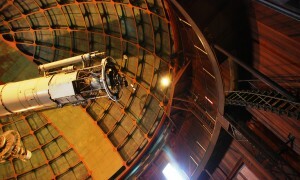 The R&D program occasionally makes use of the historic instruments at the observatory. 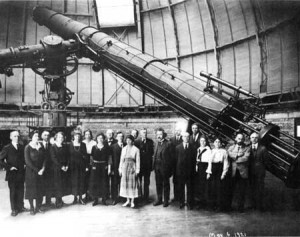 For instance, a project to measure stellar motion takes advantage of photographs taken in the early 1900s and the 1980s with the 40-inch refractor. 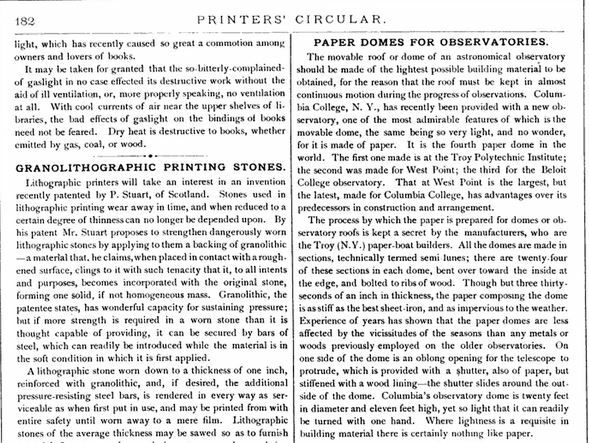 Yerkes has over 170,000 photographic plates for use by researchers. In truth, however, the observatory is mostly important because of its history, not because R&D relies on the original telescopes (University of Chicago does most of its observational astronomy at the Apache Point Observatory in New Mexico). Because of this, the observatory is frequently under threat by plans to sell or develop the surrounding property. 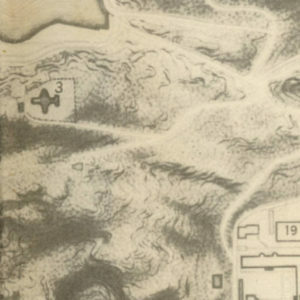 Most recently, the property was slated for development for a luxury residential complex, but in the end, an appointed study group felt the observatory had too much potential as an educational center to surrender the property to a private developer (the final report was made available to the public). 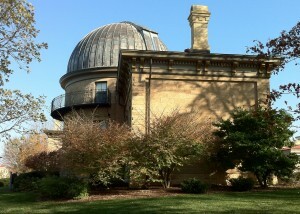 As a historian of observatories, I can only be pleased that University of Chicago has re-dedicated itself to the preservation of the property, not just because it played a large role in the development of astronomy in the United States, but because the architecture of and the landscape surrounding the building are unique in their aesthetic. Those of you who have done work at the Newberry Library in Chicago might recognize the design hand of Henry Ivy Cobb in the Yerkes Observatory buildings. Detail of Pillar, Yerkes Observatory. Photo courtesy of Yerkes Observatory.